Home > Blog > Could Your Child Be Missing Developmental Milestones Due To Hearing Loss? Today very young babies and infants are screened regularly for a variety of issues, including hearing skills. Hearing is important to enable a child to develop their speech and language skills properly. Any hearing loss or deafness can impact on these abilities. There is research that states where hearing loss is detected prior to the age of 6 months, then it can be addressed more quickly. All newborn babies are screened for hearing ability at birth in the USA. There are a few reasons for hearing loss in children. These can be congenital (present at birth) or acquired. Sometimes birth complications, such as infection, can cause hearing loss. Premature babies can also be at risk. Risks identified in mothers, such as maternal diabetes, rubella, or alcohol abuse can also be a cause of hearing loss in their offspring. Hearing loss can also be genetic. In fact, it is estimated that 50% of all children born with a hearing loss is hereditary. A child may be born with perfect hearing, but there may be factors that they acquire which can lead to hearing loss. These can include, infections, head injuries, constant loud noises or a perforated eardrum, although there are many more. Of course, children can change at different rates and this is a just a general list. However, their learning, vocalizing and speech development will be impaired if their have hearing loss. You will be able to notice that they don’t interact as much as they should do, which will prompt you to consult a Pediatric ENT specialist to ascertain whether there is a hearing problem and whether it needs treating or whether it is transient. 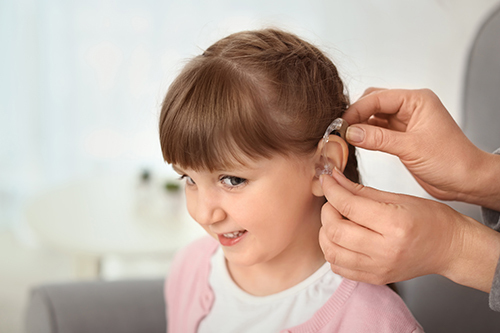 There may be hearing loss in older children and these should also be monitored closely. For example, have you noticed that your child is mumbling more often, or perhaps they don’t reply when you call them/ Do they sit nearer to the television or do they turn it up to higher volumes. You may notice they speak a bit differently to children of the same age (especially pre-school children) or they point or gesticulate rather than speak to attract attention. All these things could point to hearing loss and should be investigated.